OSLO, Norway (AP) – Education advocate Malala Yousafzai became the youngest Nobel winner ever as she and Kailash Satyarthi of India won the Nobel Peace Prize on Friday for working to protect children from slavery, extremism and child labor at great risk to their own lives. By honoring a 17-year-old Muslim girl from Pakistan and a 60-year-old Hindu man from India, the Norwegian Nobel Committee linked the peace award to conflicts between world religions and neighboring nuclear powers as well as drawing attention to children’s rights. She said it was an honor to share the prize Satyarthi, who has worked tirelessly to protect children, and invited the prime ministers of both India and Pakistan to attend the Nobel ceremony in December. “Child slavery is a crime against humanity. Humanity itself is at stake here. A lot of work still remains, but I will see the end of child labor in my lifetime,” Satyarthi told The Associated Press at his office in New Delhi. News of the award set off celebrations on the streets of Mingora, Malala’s hometown in Pakistan‘s volatile Swat Valley, with residents greeting each other and distributing sweets. At the town’s Khushal Public School, which is owned by Malala’s father, students danced in celebration Friday, jumping up and down. She was critically injured on Oct. 9, 2012, when a Taliban gunman boarded her school bus and shot her in the head. She survived through luck – the bullet did not enter her brain – and by the quick intervention of British doctors visiting Pakistan. Yet her memoir, “I Am Malala,” published last year, reminded the world that she was still just a teenager – one who likes TV shows such as “Ugly Betty” and the cooking show “MasterChef,” who worries about her clothes and her hair and wishes she was taller. Ritter reported from Stockholm. Danica Kirka in Birmingham, England; Jill Lawless in London; Muneeza Naqvi in New Delhi; Sherin Zada in Mingora, Pakistan; Kathy Gannon in New York; and Josh Lederman in Washington contributed to this report. 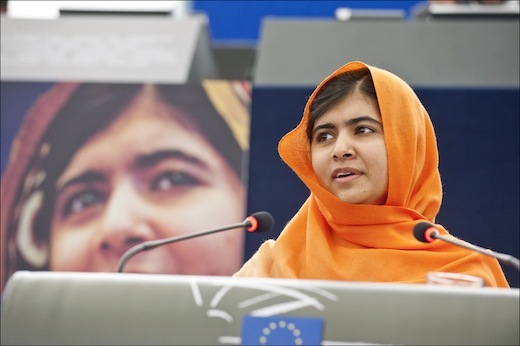 Photo: Pakistani teenager Malala Yousafzai addresses the members of the European Parliament in the plenary session, making a passionate plea for more education, as she accepted the 2013 Sakharov Prize for Freedom of Thought during a ceremony in Strasbourg. © European Union 2013 – European Parliament. (Attribution-NonCommercial-NoDerivs Creative Commons license).